Ubuntu 12.04 LTS has some cool applications installed by default but just after a fresh installation – you need to install additional drives for the devices and printer is one of them. Although, Drivers are available for almost all popular printers – specially for Canon and HP printers. 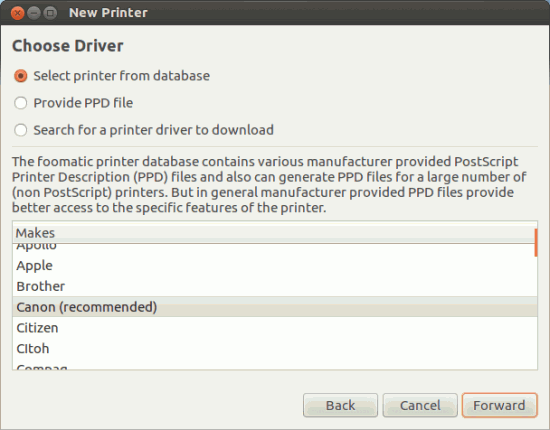 A simple printing application is installed by default but it won’t do anything unless you specified the required drivers. 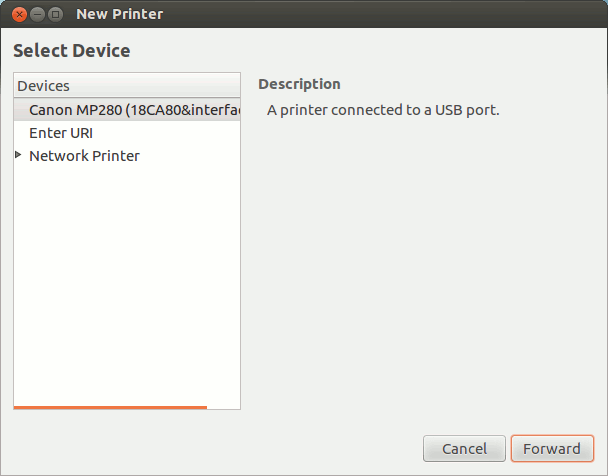 Here is the simple step by step instruction on installing a printer software on Ubuntu 12.04, although I’ve explained it using a Canon printer (Pixma MP 280 series) but the process should be same for any kind of printer. step #1. 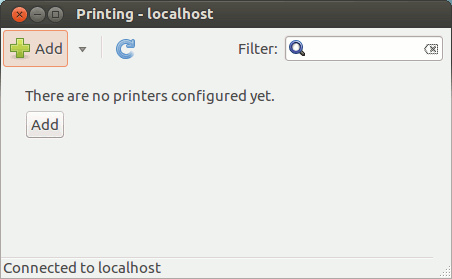 Connect the printer to computer (usually through a USB port) and switch on the printer. Then, follow the instructions – your printer will be automatically detected and you just need to follow the on screen instruction to setup the printer. 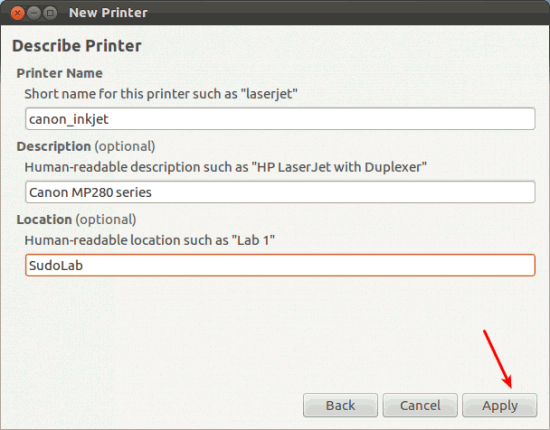 Next, Give printer a descriptive name and location – it help you to identify the printer. Finally, click on Apply to install the appropriate driver. step #3. Now the installation is complete. print a test page or something else (useful, like a cheatsheet for something) to test. That’s All – Now you can start printing cool photos with Ubuntu! Sometimes if the driver is not available or the above process doesn’t work – then don’t be panic. You can download the specific driver (*.deb package or a tar archive) manually from the official site of your printer manufacturer. In Ubuntu, a default printing application (probably a meta application) is installed by default but when you will add a printer (not necessarily a Canon printer, same thing might happens with a HP printer ) – it may not be get detected by default, in that case you can install it manually, but make sure that you install the driver from right series. 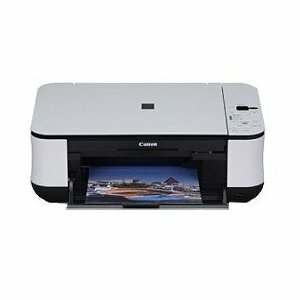 Canon Pixma MP 240 and MP 287 – both are entry level printers for simple home use. It’s a decent All in One (print+scan+copy) printer for its price. 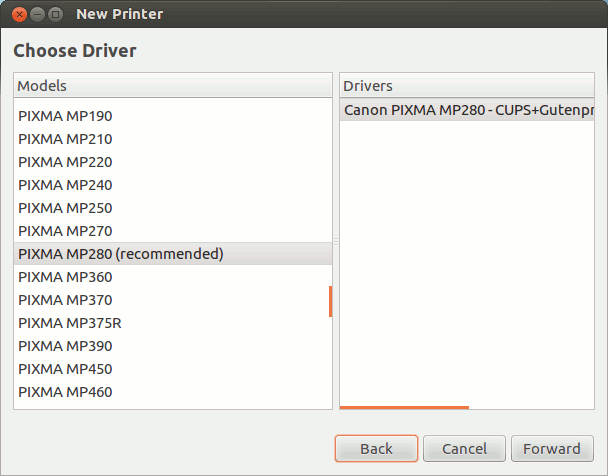 I’ve tested the driver with Canon MP287 on Ubuntu 12.04 LTS (beta) and everything worked out well as expected except some scanning issue. #2 Extract the packge and install it by running the install.sh script (and of course you will have to follow some instructions, it’s dead simple – if you’re not sure about anything, go for the default value). The Process is almost same for Pixma MP 240. Download the Debian Package (for MP 240) and follow the above instructions or you may be able to install .deb package using Software Center (but I’m not sure about that). 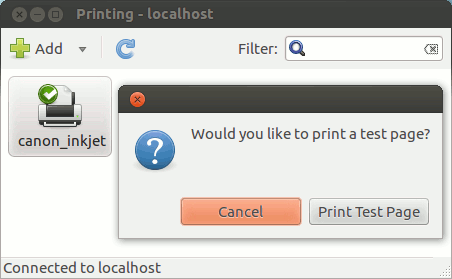 You should install the package for scanning as well as printing (obviously). Sane Project -Scanner Access Now Easy, an API for making scanning/printing more easy on GNU/Linux. After installing some must have apps on Ubuntu 11.10, you might have missed few things e.g if you’re using webcam either on Desktop/PC using USB (or other port) or in laptop or netbook, you need to install the driver software for your webcam, because it is very likely that your webcam manufacturer doesn’t supply driver software for Linux based OS such as Ubuntu (e.g I’m using Logitech Webcam, and there is no official software for GNU/Linux platform, although it’s available for Microsoft Windows – with advanced features and configure options to use/control webcam more effectively, e.g there is no option for controlling the LED indicator attached near the camera lens, in Linux based software. Similarly zoom in/out ..and a lot of other features are not available in any open source alternative). 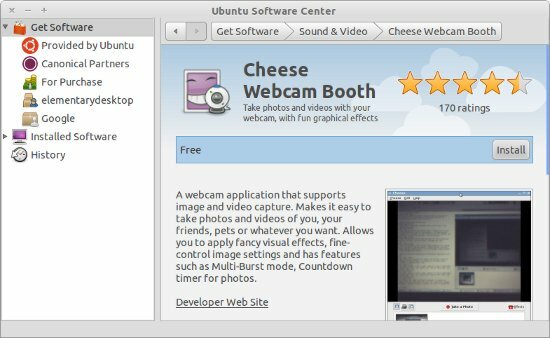 On Ubuntu 11.10 (Oneiric Ocelot) – there are many webcam softwares are available but unfortunately, none of them have features – equivalent to that we get with native drivers available for Windows. Anyway, it does have the basic features such as capturing pictures/photos (in normal and burst mode, count down timers are also available), recording videos (with different resolutions options are also available) and some funky graphical effects (it’s cool). 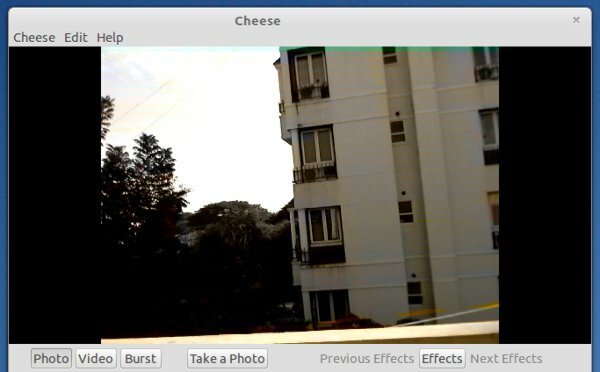 The application name is ‘Cheese’ – the version 3.0 has arrived earlier this year, with a lot of extra features, cheese is (probably) the best application for webcam, on Gnome based Linux distributions. 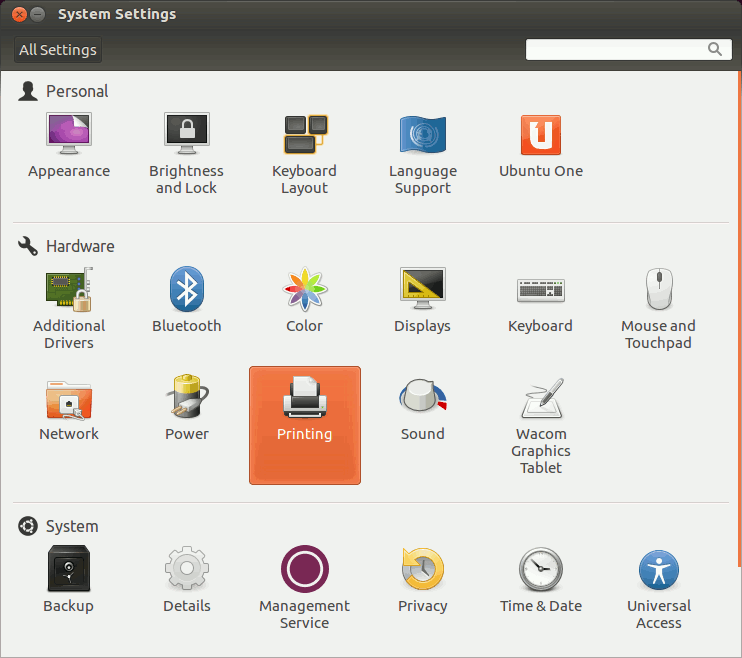 Cheese 3.0 requires Gnome 3 (although older versions run smoothly on Gnome 2.*). You can either install it from Ubuntu Software Center (search for ‘cheese’ and click on install) or Command Line interface – terminal. Have Fun! check out the preferences and effects – for other features/options.